Pre-Requisite: The Level 1 workshop must be completed prior to attending Level 2 workshop. Level 2 will deepen your understanding of Gottman Method Couples Therapy. It'll expand your strategies and interventions in your couples counseling work! 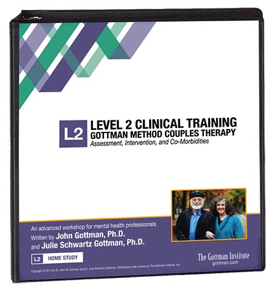 Training for Couples Therapy now offers the Gottman Method professional workshop “Level 2: Assessment, Intervention, and Co-Morbidities” training created by Drs. John and Julie Gottman. You’ll deepen your understanding of the Gottman Method and expand your strategies and interventions in your counseling work with couples in your practice. 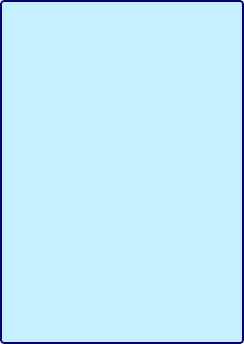 Completion of the Level 1 workshop is required before attending the Level 2 training. Registration discounts up to $250! See registration page for details. In the Level 2 training you will have the opportunity to practice and integrate Drs. John and Julie Gottman's Assessment and Intervention Methods. Our goals are to immerse you in the Gottman Method and help you gain confidence in using the techniques in your clinical work. This three day training is also the next step toward certification as a Gottman Therapist. You will view original videos of couples from Gottman's famous "Love Lab", as well as updated video of the Gottman's demonstrating assessment and interventions in case examples pulled from their private practice. You will get plenty of opportunity over the three days to practice using the interventions in role play to help you gain confidence using them with your couples. The last day we will focus on complicated cases involving co-morbidities. We will cover how to assess for them, when to treat and how to treat them in couples therapy. We will focus on cases involving affairs, PTSD, addiction and domestic violence. • Assess a couple’s “Friendship Profile”, “Conflict Profile”, and “Shared Meanings Profile”. • Develop interventions that couples can use as antidotes to the “Four Horsemen". • Help couples to soothe physiological flooding. • Apply six modes of changing the “Attack/Defend System” in a couple’s interactions. • Assist couples in establishing dialogue about their grid-locked conflicts. • Select and implement interventions to help couples create a shared system of values and meaning. when couples therapy is contraindicated. 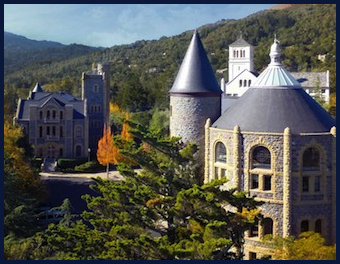 These Level 2 workshops are presented in a “Professional Retreat” setting just minutes north of San Francisco and the Golden Gate Bridge at the SF Theological in San Anselmo. Please see registration for venue photo’s and more information.